Kids” – true fact , or Burner myth? I took mine with me anyway. The one time I didn’t lock my bike, a blue Schwinn Moab mountain bike, it was stolen. I sat down facing my bike about 15 feet away. Someone came up to talk to me, I looked up a minute later, and it was gone. I left a note with my name, playa name, camp name, pod name, and cell phone at the camp were it was stolen, and no one ever returned it. I had that bike for about 15 years. It was in good shape, and I can’t afford to replace it. Burning Man collected most of the bikes left on the Playa and are cataloging them in a Reno warehouse trying to get them back to their rightful owners. Most people didn’t leave their bikes on purpose. Mine was ‘borrowed’ the one time I didn’t lock it. Very unfortunate since it was early in the week. Sounds like several thousand other people had the same issue. I’m watching for a 3 min bike ride Go pro video. It’s excellllent. Done by Dustin Watchman @ dustinwatchman.com. You just posted his dream video. You’ll like bicycle ride with the music by Queen. Bicycle. “I just want to ride my bicycle”. It’s out there. I hope to see it on your blog. It’s on U-Tube. We hope to see it on Burners.Me WE LOVE YOUR SITE! “local kids”? At this rate, every local kid gets 50 bikes each. The rumor makes no sense. there are a lot of people doing it hard in Northern Nevada. But, I agree, that after 25 years of Burning Man, they probably each have at least one half-working $50 Walmart special caked in Playa dust. I am still hoping that our Gary Fisher bike with D’lite double bike trailer shows up miraculously from having been BORROWED post sunrise at Robot Heart! I would rather gift such rig than having it stolen/borrowed or having it become MOOP or picked up by a flat bed destination unknown. While having lived through the rather large expansion of the Burner population over our 12 years of participating, we can understand the exponential increase of undesirables, however it still boggles our mind that someone chooses to inflict upon others what they would not want to put upon themselves in this type of environment. The frustration of getting back to our camp post a very sweet sunrise set added a rather unpleasant aftertaste, especially that it was the one time we did not lock it! … I am not always seeing the world through my pink colored Robot Heart glasses! However we will try to continue to hope that the sharing such moments and events can register through and through to influence in a positive manner social interactions and ethics along the way…. Unless you make arrangements with DPW and write the persons name on it ANYTHING you leave on the playa is MOOP! That’s been my understanding for the last 14 years. Or for some that got screwed “can’t see your license plate”” TICKET” might have said screw it….. Lot of people can’t move the plate for better viewing for LEO’s..
What part of Leave No Trace means leave your bike? Give it to local kids yourself. MOOOOOP! Exactly!!! Leave no trace means exactly that. Somehow I think a lot of these bikes however were “borrowed”, and by that I mean stolen, and then abandoned on the Playa. I’m sure there are many people that had their bikes stolen that would love to have them back. My camp acquired two bikes through abandonment this year. We took them with us and plan to use them next year, to my knowledge. They both appeared thursday/friday sometime after my camp’s main party. I am sure someone would be happy to haul them off. And what they do with them then is their business. I also heard that bikes left at the cafe, the locks were cut and the bikes moved. So somebody who left one there may have thought it was stolen when it really wasn’t. No notes were left to let people know. “At the end of the event, lost bikes (e.g. abandoned ones that have been gathered up) can be recovered at Playa Info. Unclaimed bikes are donated to Reno-based non-profits that fix them up and provide them to underprivileged kids. Bottom line bikes are moop and are not converted to community yellow bikes. 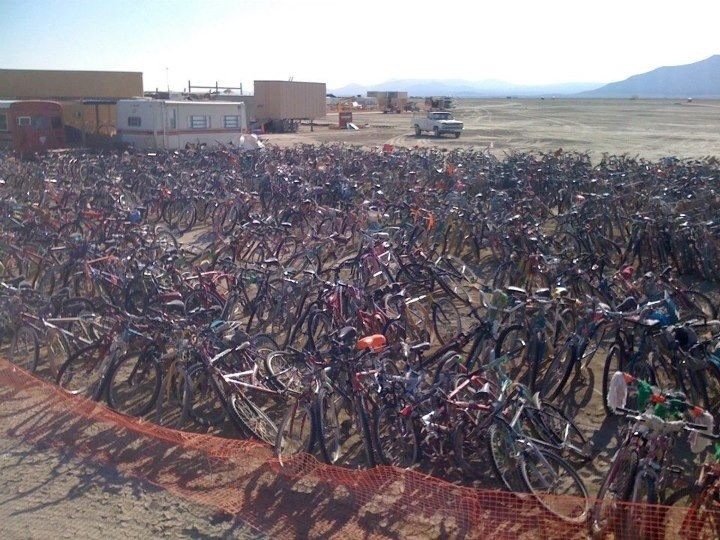 From the Survival Guide: LEAVE NO TRACE: DO NOT ditch your bike at Burning Man! Dealing with abandoned bikes stretches our over-taxed resources. Further questions can be sent to bikesatburningmandotcom. MOOP! I’m sure everyone in Nevada has a bike now from many years of bikes being left on the playa. Take your bikes with you and donate them back at home if you need to! We lost two bikes to theft in our camp this year. Good reason to bring and use a lock. I hear guys with flatbeds show up to pick them up. I am sure each driver has their own individual intent for said bikes. I am sure some get converted to “yellow bikes” too? Would be interesting to know the facts on this.